the whole game and we're not going to poop out. him or hate him, The Old Ball Coach knows what he's doing. He can find a way to get his teams home even in less than ideal situations. first half lacked any sort of flow–chunky is the best descriptor. tapped his shoulders and stopped play. stanza at six, 19-13 with just over eight minutes left before the break. cut the VCU lead to 32-29 heading into the break. Guest played outstanding minutes off the bench, as Graham and Juvonte Reddic battled foul troubles. pulled away and made just enough free throws down the stretch. The 72-65 win was VCUs 11th straight victory and moved the Rams to 2-0 in the Atlantic 10. 58-53 lead, he summoned Reddic back into play. an 8-0 run and a 66-53 lead with 3:28 remaining. against the most talented team the Rams have faced in a true road game. lead toggled between three and seven points for 90% of the game minutes. wasn't collecting turnovers in its wheel-barrow. future challenges and crowds that are coming. Ever the winner, that Darius Theus. half turnovers, and Bona turned them into exactly bupky points. has a 31/6 assist-to-turnover ratio. 63.6%; 38.5%. 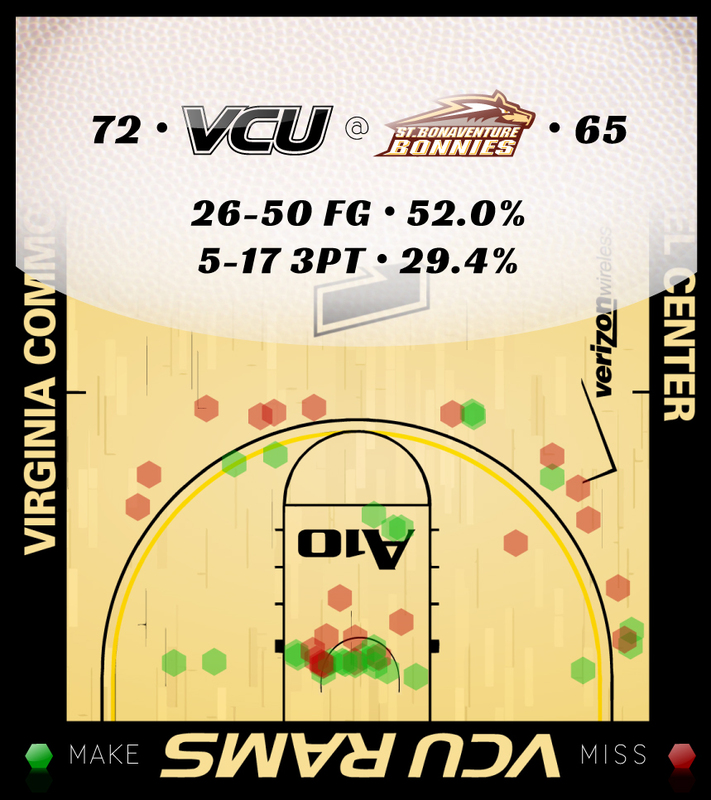 VCU made 21-33 of its two-point shots, and Bona made just 10-26 of its two-pointers. That's stout. the Rams are 15-64 in the three games since. played out. This pace of swish cannot continue against top teams. Also, VCU was 13-22 (59%) from the line against ETSU. Saturday. I can live with being a 70% free throw shooting team, the cumulative total of these four games. But for the love of everything that grows hair can we level that out a bit? ***Treveon Graham. The Freight Train put up a 13-points, five rebounds second half. As he continues to mature, Graham will add noteworthy games to his ledger. In this one, it's the first I can remember where Graham put the team on his back during a close road game. **Jarred Guest. Allrighty then. Guest played nine total minutes against Dayton and five total minutes against Lehigh. Foul trouble put Guest on the floor for nine first half minutes Saturday. He responded, with seven points, three rebounds, and a steal. Guest also hit a key baseline jumper in the second half. *Darius Theus. As opposed to Graham, we've seen this kind of game from Theus. The senior simply managed the game extremely well–seven assists and one turnover. Sometimes glitzy is defined by the lack of bad. Not to be nitpicky, Mike, but Spurrier is the Head Ball Coach not the Old Ball Coach. “As opposed to Graham, we’ve seen this kind of game from Theus” ? I think Graham [except for 3 point shooting] has been one of the steadier Rams.